The London Times celebrated its 100th birthday last Sunday. Of late the Times has shown the effects of age. 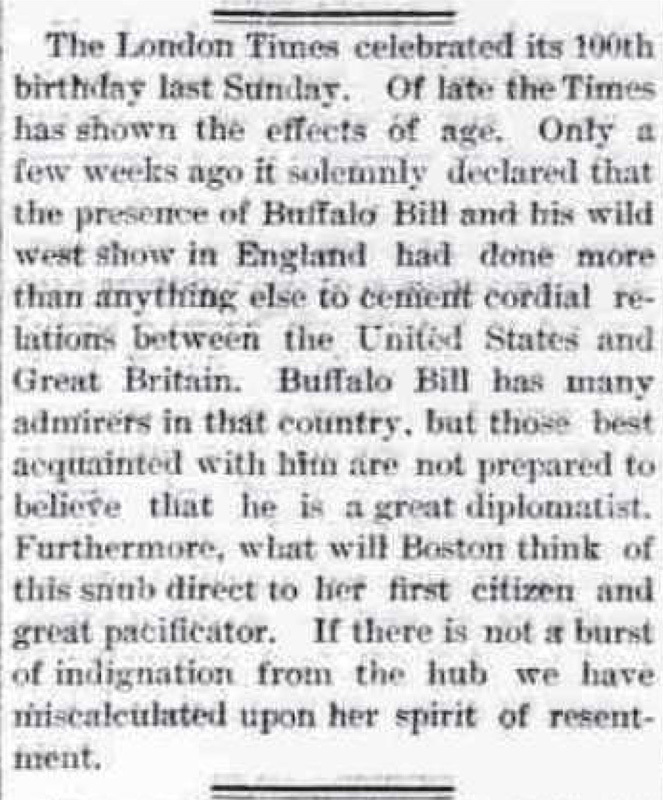 Only a few weeks ago it solemnly declared that the presence of Buffalo Bill and his wild west show in England had done more than anything else to cement cordial relations between the United States and Great Britain. 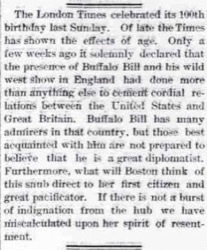 Buffalo Bill has many admirers in that country, but those best acquainted with him are not prepared to believe that he is a great diplomatist. Furthermore, what will Boston think of this snub direct to her first citizen  and great pacificator. If there is not a burst of indignation from the hub we have miscalculated upon her spirit of resentment. People: Adams, Charles Francis, 1807-1886.